​WHY USE GODDESS FACES COSMETICS? AS A LICENSED SKINCARE SPECIALIST, MRZ. JAYE KNOWS EXACTLY WHAT INGREDIENTS SHOULD BE IN THESE PRODUCTS. The "Island Goddess" Collection was created Mrz. Jaye, for Goddesses of all skin tones. A blend of the best ingredients with the heart of the Virgin Islands in every product. The "Island Goddess" Collection consist of the Oil Free Matte Full Coverage Foundation that comes in 12 shades. The smooth Liquid Matte lip colors that come is 6 shades and Lip Glosses that come in 5 luxurious colors. Last, but not least the Duo Wet/Dry Compact Mineral Pressed Powder which ranges from light to dark shades and comes in 11 shades. These Foundations are Oil Free and Paraben free, with UVB and UVA protection, built in sunscreen, smooth texture for easy application and provides full coverage, but feels light. Never caked on! Lip colors that provide up to 8 hours of long wear brilliant shine and comes in the most gorgeous everyday wear colors. PLUS, our liquid mattes have vitamin E, which provides smooth application, stays moist and never dries or cracks on the lips. Everything you've ever wanted in a make-up line is FINALLY HERE! 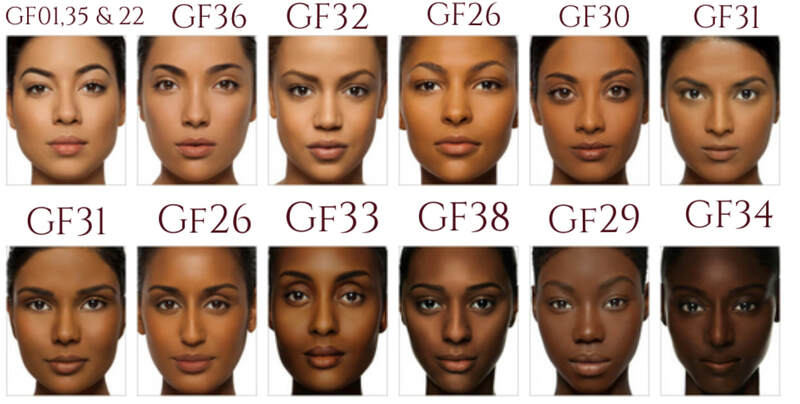 Use Color Chart below to find your correct shade. Remember, our Skin tones consist of Red and Yellow/Gold undertones. That means that a shade may be used for multiple skin tones. Net wt. .28 oz/ 8 gr. A velvety and light-weight oil-free Mineral powder foundation easy-to-apply wet or dry to produce a smooth matte finish. Can be used with or without Oil Free Matte Foundation. Apply with a dry sponge, a damp sponge for a dewy finish or a kabuki brush for a smooth matte finish. SUGGESTION: Spray a light mist of Vitamin Setting Mist to set the make-up, we also recommend using our Radiance Primer, First Base or Matifying Primer. • A high quality foundation that provides excellent coverage. • High Definition coverage helps to even out complexion, reduces the appearance of skin imperfections, and is excellent for Television. • May be used as a finishing powder over liquid foundation to provide an oil-free, long lasting, velvet finish. • Dimethicone : helps to retain moisture. • Silica: a natural ingredient that provides a water resistant effect. • Titanium Dioxide: a sunscreen that filters UV rays and has deflective properties. • Packaged in a mirrored compact with aerated section for sponge. Mica, Trimethylsiloxysilicate, Dimethicone, Boron Nitride, Silica, Polyethylene, Nylon 12, Methicone, Chlorphenesin, Potassium Sorbate, Hydrogenated Lecithin. MAY CONTAIN: Iron Oxide(CI77491, CI77492, CI77499), Titanium Dioxide(CI778910. is A simple, easy, quick reference guide for All women. This guide provides you with informative chapters on how to start a healthy skincare regimen, focused on your particular complexion, ethnicity and skincare needs. Learn about NATURAL ingredients and WAYS to treat your skin issues naturally. This guide also brings back the basics of makeup application with step by step instructions on how to apply your makeup. There's also a step by step 20 min daily makeup routine And so so much more. A Step by step instruction guide that you can use daily and take with you anywhere? ALL OFFERS: Quantities are limited and all offers are subject to availability while supplies last. To ensure best availability, there is a limit of one to a customer. Offers are available to U.S. residents only. All "Free Shipping" offers are for STANDARD SHIPPING only, unless otherwise specified. Any applicable purchase amount does not include shipping, handling or sales tax charges; items noted as not eligible; or items that are not in stock at the time of purchase. Please note expiration dates where applicable. Offers cannot be applied to previously placed orders. We reserve the right to cancel any order due to unauthorized, altered or ineligible use of offer and to modify or cancel any promotion due to system error or unforeseen problems. We reserve the right to substitute any free item offered with an item of equal or greater value. Ongoing offers are subject to change without notice. Prices and product availability are subject to change. Other restrictions may apply. *Prices and products availability are subject to change. Unfortunately, due to the nature of our products, we are unable to offer refunds, returns/exchanges. Unable to complete my order. Goddess Faces by Mrz. Jaye is committed to protecting the privacy and security of customers and their personal information by holding all customer information securely. Please review the following policy information to learn how Goddess Faces by Mrz. Jaye protects all customers' personal information. Orders are processed & shipped within 3-7 business days from the date of your order. • ALL Order Fields are completely filled out. Please ensure your shipping address is current and correct. Goddess Faces by Mrz. Jaye cannot be held responsible or liable for misdirected packages due to old or incorrect addresses. All orders placed after 5:00 p.m. is considered the next business day. Although we strive to ship out our products as quickly as possible, occasionally there are inventory delays, but we will ship orders out as soon as possible.